This is a beautiful bedspread! I got the pale yellow, and it is exactly the shade I hoped it would be!! I will definitely order more from this company! Great service, and good quality at an excellent price! A comfortable blend of elegance and casual style, this Merit Linens Premium coverlet set will bring a breath of fresh air to your bedroom decor. The soft quilt and matching shams are crafted from double brushed microfiber with a lovely damask quilted pattern, perfect for keeping you at a comfortable temperature all year round. The machine washable set is hypoallergenic as well as wrinkle and stain-resistant, and comes in a variety of trendy colors to coordinate with your space. I bought a Queen set. When it arrived, I put it in the dryer on the normal setting and fluffed it for about 20 minutes to shake out any wrinkles. The coverlet color (aqua) is very nice. 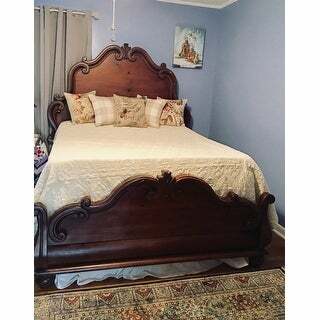 I wish it was a few inches longer & wider, but I didn't measure my bed (and its height) so if you're thinking of buying, do that first. Overall very nice. The Merit Linens Premium Ultr Soft Damask Pattern Quilted Coverlet Set is just perfect. I needed a lightweight coverlet/ quilt for my son’s bed, and this fit the bill. It is super-soft and the design is light, not feminine, nor masculine. The color is true to the photos. I ordered the light gray. I am addicted to pretty linens, these coverlets are soft, washes easily, never wrinkles and stays true to color and size. I've bought several styles of different colors and sizes for guest rooms and love them all.. 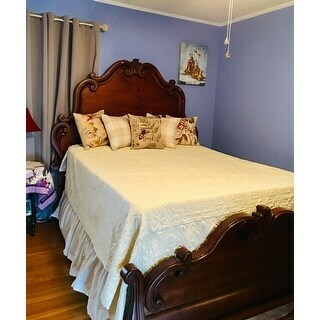 I purchased this queen size set in Ivory for the winter and Christmas holiday, to couple with silver and blue pillows and assessories... The creamy color is beautiful, The weight is perfect, not thin at all and The texture and cozy feel of the cotton is perfect. I decorate with a cozy carriage Decore, and I highly recommend this coverlet set. The color shown was true to what was pictured. The quilt and shams were lightweight and soft like i had in mind for the items. The quilt and shams also laundered well and colors did not fade.Overall a good purchase. 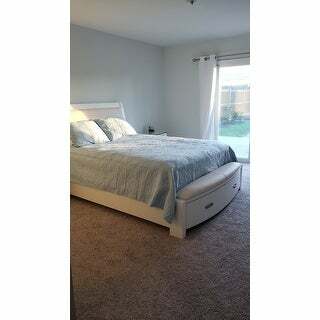 King size is perfect for a Queen bed if you want it to go to the floor on both sides. I love the light weight of the quilted coverlet. Very happy with this purchase! Love it......matches my comforter set. This coverlet adds warmth to my comforter and i can just that in the summer. A nice fresh white with a lovely pattern. I'm pleased with this lightweight coverlet. 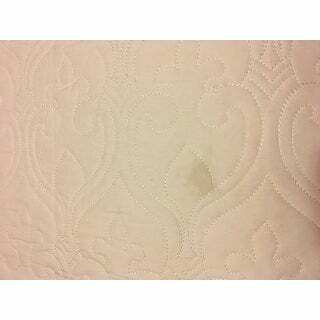 This is a thin true White (not off-white) Soft Coverlet which is just what I wanted. 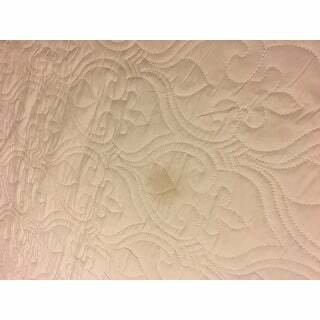 If you want a thick plush coverlet - this is not it. I got what I ordered and wanted so I rated it 5 stars. Great for anyone going thru menopause as it is not hot at all. White Coverlet and White Curtains and you can do different colors with pillows and Artwork so makes changing up a room often very easy. 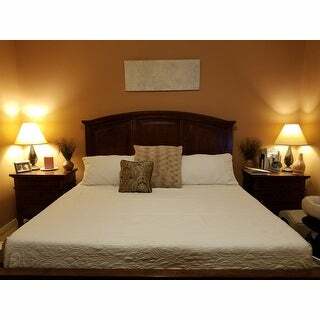 I do recommend this coverlet for price, color and softness. 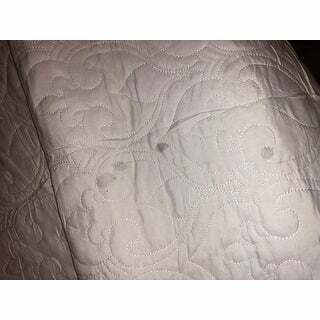 Two dark spots on comforter. I was able to wash them out but I don’t expect to have to. Otherwise, I’m happy with purchase. The one I received had MULTIPLE stains all over it. Took it right out of the bag and put it on my bed, the amount of stains all over it was so disgusting...took it right back off to pack away. Love this Coverlet set! I got it in the off white color. It’s the perfect weight for summer months and it’s very soft and comfy! Perfect color, and look for the room. Thin coverlet for our Florida nights. Just as I expected! Really nice. Just as described. Love them. Simple elegance. Highly functional. Beautiful after multiple washings (softer too). Highly recommend. I am pleased with the quilt. The workmanship is excellent and the fabric is very soft and durable. After checking many in store quilts and looking at the prices, this quilt far exceeded the quality of much more expensive ones. I love it! 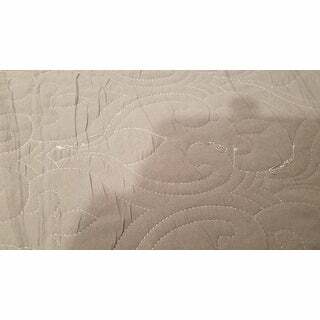 I was so excited to receive this Coverlet. When it arrived I was a tiny bit disappointed that it was pretty wrinkled. I ordered the yellow and the color was much more washed out looking than I had expected however it is the softest of soft and felt amazing. The size barely went to the bottom of my mattress and it could have been a wee bit longer but this is a nice coverlet for a summer bedroom feel. It is light and airy. The stitching is nice as well as the design. 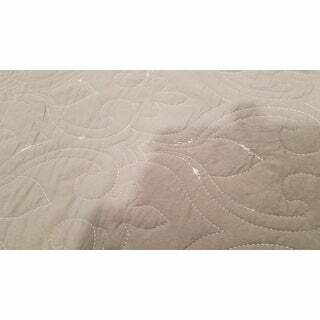 I would recommend this coverlet if what you are looking for is a lightweight uplift to your bedding. These coverlets are very well made, and the fabric is breathable. The color is a little bluer than I anticipated but very pretty. Would recommend. Love, love, love this comforter! It is both super soft and super warm. The only turn off was the smell upon arrival, which went away after ther first washing. "What do you mean by microfiber. Is made of cotton and micro on the other side?" This sheet set is made from a man-made brushed microfiber, made to be very soft and breathable, but still warm for those winter months. "my bed has twenty four deep corners. California king deep.how deep are yours." The sheets are 16 inches deep, so they are unlikely to fit your bed. "Is the bedspread oversized "
"I like my comforters/quilts to hang a little off the bed, would me getting the King size for this be too big for my queen bed?" "Are the colors shown the true colors. I.e, the ivory looks like pale yellow and the grey looks like a taupe/ grey brown. Is this correct or are they pictured differently than actual color shown." The pictures are as they are listed, sometimes the lighting of the pictures may make them look differently.